If you’re looking for Swedish Live Casinos you’ve come to the right place. I explain what the current regulations are and where you’ll be able to play safely. On the 1st January 2019, Sweden introduced a new gambling act and licensing system to regulate online gaming. The new regulations require any online casino operating in the Swedish market to have an authorised license. Those without would be expelled from the market. Operators have a duty to protect gamblers from excessive gambling. Players have the ability to self exclude from gambling. Bonuses are only permitted for the first gambling session. Payment transactions will be blocked between players and unlicensed operators. ISP’s will set up warning message for websites offering unlicensed gambling. It will become a criminal offence to advertise and promote unlicensed operators. So on the 1st of January there was a flurry of applications by online casinos for Licenses. Also a number of online casinos ceased offering their games to Swedish citizens. 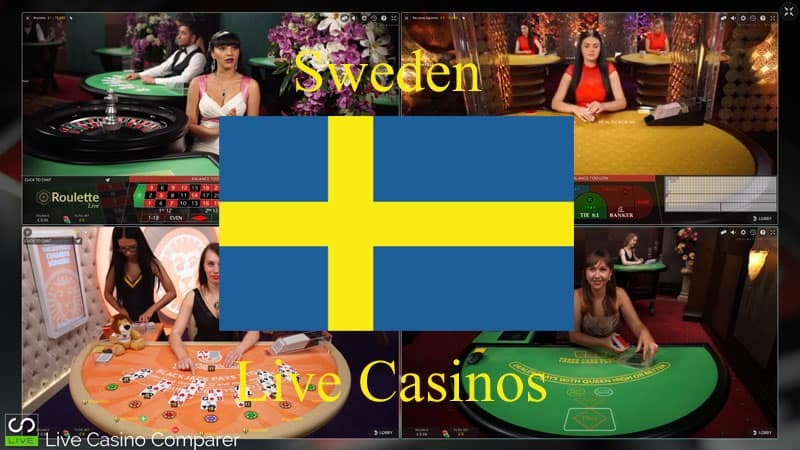 It’s great news, since regulation there’s quite a few Live Casinos offering their games to Swedish players. Some provide a tailored solution, where the website language can be changed to Swedish and financial transactions can be conducted in SEK rather than Euros, GBP or USD. The default table language at Live Casinos is English but there are one or two casinos that have dedicated tables with Swedish speaking dealers. These tend to be the roulette tables. Sometimes the dealers move to other general play tables and when that happens they’re normally happy to speak in both languages. I met Disa, who is a Swedish live dealer when I visited the Evolution Casino Studios in Malta. Be sure to read my interview with her. Casino Hold Em €0.50 – €75,000. 3 Card Poker €1 – €10,000. Caribbean Stud Poker €1 – €3,000. Ultimate Texas Hold’em €0.50 – €500. Casino Hold Em €0.50 – €4,000. Ultimate Texas Hold’em €1 – €1,000. Casino Hold Em €0.50 – €7,500. 3 Card Poker €1.00 – €5,000. Caribbean Stud Poker €1 – €1.5k. Casino Hold Em €0.50 -€1,500. 3 Card Poker €1 – €5,000. If you want a wider choice of live casinos checkout the rest of this site. The casinos that accept Swedish players are clearly marked. Until the recent re-regulation of gambling in Sweden the rules and regulations were defined in the Lotteries Act, which was last updated in 2015. Oversight of the Act is provided by the Swedish Gambling Authority (lotteri inspektionen). They have responsibility for controlling and licensing gambling activities within Sweden. Safeguard consumers’ interests and make sure that the potentially harmful social effects of gambling are reduced. Ensure a sound and safe gaming market. Contribute to a reduction in the number of illegal gambling and lottery operations. The drawing of tickets, guessing, betting and similar procedures. Amusements at fairs and amusement parks. Bingo games, gaming machines, roulette games, dice games, card games, chain letter games or similar games. The games listed in the Act are collectively referred to as “Lotteries”, but the word covers all forms of physical gaming. With some exceptions all require a license to operate in Sweden and these are granted by municipalities, county administrative boards, the Government and the Gaming Board for Sweden. The Municipalities are responsible for licensing and compliance of local lotteries. The County Administrative Boards are responsible for licensing and compliance of bingo and regional lotteries. The Government grants licenses to ATG and Svenska Spel. The Gaming Board for Sweden is responsible for granting other licences and for compliance. It’s legal for online casinos based outside of Sweden to offer their games to Swedish players as long as they hold one of the new Licenses. Restrictions are now in place to prevent unlicensed casinos advertising, in fact it’s now a criminal offence. Most of the online casinos are based in Malta and Gibraltar, and operate under multiple licenses from the many regulated environments. The Swedish Gaming Market is experiencing massive growth. Figures compiled by the Swedish Gambling Authority show that statistically, every inhabitant of Sweden who is over 18 years old gambles about SEK 5,000 every year. That’s equivalent to about 2.5 % of their disposable income. About half is returned to the players in the form of winnings. Interestingly the average adult lost around SEK 2,133 to the regulated market. The average loss while playing at international online casinos was a mere SEK 447 per adult. The re-regulation has seen an 18% Tax levy on licensed operators, which is one of the reasons the government was behind the changes. Tax revenue is a big motivator.